Xanthine oxidoreductase has been proposed to play a role in the development of local and systemic effects of acute pancreatitis. Under physiologic conditions, the enzyme exists mainly as xanthine dehydrogenase (XDH) but can be converted by proteolytic cleavage to its superoxide-generating form xanthine oxidase (XOD). In addition to its intracellular location XDH/XOD is also associated to the polysaccharide chains of proteoglycans on the external endothelial cell membrane. In the early stages of acute pancreatitis, this enzyme seems to be arising from its mobilization from the gastrointestinal endothelial cell surface. Taking into account the ability of α-amylase to hydrolyze the internal α-1,4 linkages of polysaccharides, we wanted to elucidate the involvement of α-amylase in XDH/XOD mobilization from the gastrointestinal endothelial cell surface and the relevance of the ascitic fluid (AF) as the source of α-amylase in experimental acute pancreatitis. Acute pancreatitis was induced in male Wistar rats by intraductal administration of 5% sodium taurocholate. In another experimental group 3000 U/Kg α-amylase was i.v. administered. The concentrations of XDH, XOD and α-amylase in plasma and AF and myeloperoxidase (MPO) in lung have been evaluated. In additional experiments, the effect of peritoneal lavage and the absorption of α-amylase present in the AF by an isolated intestine have been determined. Similar increase in XDH+XOD activity in plasma was observed after induction of acute pancreatitis and after i.v. administration of α-amylase. Nevertheless, the conversion from XDH to XOD was only observed in the pancreatitis group. Lung inflammation measured as MPO activity was observed only in the pancreatitis group. In addition peritoneal lavage prevented the increase in α-amylase and XDH+XOD in plasma after induction of pancreatitis. Finally, it was observed that α-amylase is absorbed from the AF by the intestine. During the early stages of acute pancreatitis, α-amylase absorbed from AF through the gastrointestinal tract could interfere with the binding of XDH/XOD attached to glycoproteins of the endothelial cells. Proteolytic enzymes convert XDH into its oxidase form promoting an increase in circulating XOD that has been reported to be one of the mechanisms involved in the triggering of the systemic inflammatory process. Xanthine oxidoreductase has been reported to be one of the most important sources of oxygen free radicals in different pathologies . This enzyme catalyzes the final two steps of the purine degradation pathway: oxidation of hypoxanthine and xanthine to xanthine and uric acid, respectively. Under physiologic conditions, the enzyme exists mainly as xanthine dehydrogenase (XDH), a form that uses NAD+ as electron acceptor. Nevertheless, under certain circumstances, XDH can be converted to xanthine oxidase (XOD) by limited proteolytic cleavage. XOD uses molecular oxygen as electron acceptor and consequently generates the superoxide anion , a molecule that participates in the generation of other reactive oxygen species including hydrogen peroxide, hydroxyl radical and peroxynitrite. This enzyme has been proposed to play a role in the development of both local and systemic effects of acute pancreatitis [3–6], an inflammatory process of the pancreatic gland. In experimental models of acute pancreatitis the conversion of XDH to XOD by the action of proteolytic enzymes has been reported . Also, circulating XOD seems to be a source of systemic oxidative stress . This is of importance since the systemic effects of pancreatitis, in particular pulmonary dysfunction characterized by an inflammatory infiltration of the lung parenchyma, are observed in as many as 50% of patients. Severe forms of pancreatitis progresses in two phases. In the first week the main cause of death is the systemic inflammatory response syndrome while in the second phase, sepsis-related complications are the main cause of death. Respiratory dysfunction in acute pancreatitis is usually mild and reversible, but in the severe forms of the disease lung injury could be progressive leading to an adult respiratory distress syndrome. This fact appears to be one the most important factors contributing to death in patients with acute pancreatitis during the first week of the disease . In vitro experiments have shown that in addition to its intracellular location XDH/XOD is also associated to the external endothelial cell membrane . Other experiments revealed that the addition of heparin inhibits the binding of the enzyme to endothelial cells suggesting that XDH/XOD binds to the polysaccharide chains of heparin-like proteoglycans on the endothelial-cell plasma membrane . The binding is apparently of an electrostatic nature: negatively charged groups presumably might interact with some clusters of positively charged amino acid residues of XDH/XOD . This is an important fact because during acute pancreatitis circulating XOD seems to be arising from its mobilization from the surface of endothelial cells  and not released by the pancreatic tissue. It was noteworthy that during pancreatitis XDH/XOD is mobilized only from the gastrointestinal system . Amongst the various factors released during acute pancreatitis, α-amylase could be suspected to be involved in the mobilization of XDH/XOD attached to glycoproteins of the endothelial cells. This is related to the ability of α-amylase to hydrolyze the internal α-1,4 linkages of polysaccharides that could affect some glycoproteins present in the extracellular space and disrupt the binding-site of XDH/XOD. Moreover, in vitro experiments demonstrate that α-amylase bind to glycoproteins by carbohydrate-specific interaction, in particular with glycoproteins possessing N-glycans . Enzymatic activity or carbohydrate-specific interaction could explain the displacement of XDH/XOD from the glycoprotein binding sites observed during the early stages of acute pancreatitis. On the other hand, transperitoneal absorption from ascitic fluid (AF) is one of the pathways by way of which the products released by damaged pancreas gain access to the systemic circulation. Consequently, the local concentration of α-amylase could be greater in the gastrointestinal tract than in the other organs. This could explain the fact that during pancreatitis XDH/XOD is mobilized only from the gastrointestinal tract. Therefore, in the present work, we wanted to elucidate in an experimental model of acute pancreatitis: 1) the involvement of α-amylase in XDH/XOD mobilization from the gastrointestinal endothelial cell surface and 2) the relevance of the AF as the source of α-amylase in this process. Male Wistar rats (250–300 g b.w.) were used in all experiments. Animals were housed in a controlled environment and fed with standard laboratory pelleted formula (A04, Panlab, Barcelona, Spain) and tap water ad libitum. This study conformed to European Community (Directive 86/609/EEC) for the use of experimental animals and the institutional committee of animal care and research approved it. Animals were anesthetized with an i.p. administration of 10% urethane (1 ml/100 g b.w.). The biliopancreatic duct was cannulated through the duodenum and the hepatic duct was closed by a small bulldog clamp. Pancreatitis was induced by retrograde perfusion into the biliopancreatic duct of 5% sodium taurocholate (Sigma, St Louis, Missouri, USA) in a volume of 0.1 ml/100 g b.w. using a perfusion pump (Harvard Instruments, Edenbridge, UK), 0.3 ml/min . Control animals received an intraductal perfusion of saline solution (NaCl 0.9%). We have previously reported that, in this model, a significant neutrophil infiltration occurs in the lung 3 h after the induction of pancreatitis . Therefore this was the time point chosen for all experiments. • Controls (C): Intraductal infusion of saline solution (n = 6). • Experimental acute pancreatitis (EAP): Intraductal infusion of 5% sodium taurocholate (n = 6). • α-Amylase (A): Animals were treated with 3000 U/kg α-amylase (Roche, Basel, Switzerland) given as an intravenous bolus immediately before an intraductal infusion of saline solution. Previously α-amylase was purified by Sephadex G-25 chromatography in order to remove ammonium sulfate present in the buffer. • Heat-denatured α-amylase (DA): In order to determine the specificity of α-amylase, animals were treated with heat-denatured α-amylase before the intraductal perfusion of saline solution (n = 6). In this case, the enzyme was previously heated during 60 min at 100°C. In these conditions, the residual enzymatic activity observed was less than 1%. Plasma and lung tissue samples were obtained 3 h after the intraductal infusion, immediately frozen and maintained at -80°C until XOD, XDH and α-amylase were measured in plasma and myeloperoxidase (MPO) was measured in lung. • Experimental acute pancreatitis + peritoneal lavage (EAP+PL): Intraductal perfusion of 5% sodium taurocholate (n = 6). In addition, a polyethylene catheter PE-10 (Clay-Adams, UK) was placed into the peritoneal cavity and 60 ml of warm (37°C) sterile saline solution was infused at a constant flow (20 ml/h) immediately after induction of pancreatitis. To evaluate the capacity of the intestinal tract on α-amylase absorption from the AF we designed an ex vivo experiment incubating an isolated rat intestine with AF collected from pancreatitis animals 3 h after the intraductal perfusion of taurocholate. The concentration of amylase released in the vascular perfusate was measured up to 1 h.
Small bowel was isolated as previously described . Briefly, the abdomen was opened and the colon was isolated and removed after ligation of the right and middle colic vessels. The portal vascular pedicle was prepared by transecting all pancreatic, gastric and splenic vessels. The superior mesenteric artery was exposed, cannulated with PE-50 tubing (Clay-Adams, UK) and immediately perfused with 5 ml of saline solution at 4°C. The portal vein was cannulated with another PE-150 tubing (Clay-Adams, UK), and the small bowel was free from the retroperitoneal tissue. The apertures of the intestinal lumen were closed with a ligature and the small bowel was placed in a recipient containing 25 ml of saline solution at 4°C and brought to the perfusion system. Cannulated small bowel was placed into a recipient with 15 ml of saline solution kept at 37°C. The mesenteric artery was perfused with a modified Krebs-Henseleit buffer containing 200 mg/dl of glucose at a maximum pressure of 100 mm Hg. The perfusate was kept at 37°C and oxygenated with 95% O2 and 5% CO2 during all the perfusion period. The specimen was maintained during 10 min in these conditions. Then, saline solution was replaced for 15 ml of AF and the vascular perfusion continued during 60 min. Samples were obtained at 1, 2, 3, 4, 5, 10, 30 and 60 min of the perfusion period. α-Amylase was determined using commercial kits from Sigma, (St Louis, Missouri, USA) according to the supplier's specifications. Measured photometrically employing 3,3',5,5'-tetramethylbenzidine as a substrate . XOD and XDH activity were measured fluorometrically at 37°C via oxidation of pterin to isoxanthopterin, using methylene blue as an electron acceptor . Data have been expressed as mean ± SEM. Means of different groups were compared using a one-way analysis of variance. Student's t test was performed for evaluation of significant differences between groups. Differences were assumed to be significant when p < 0.05. Figure 1 shows the effect of acute pancreatitis or α-amylase administration on plasma α-amylase, MPO, XDH and XOD concentration. In our experimental conditions, after α-amylase administration the level of XDH+XOD in plasma was similar to that observed during acute pancreatitis (Figure 1a). As expected, denatured α-amylase-treated animals showed no significant increase in plasma α-amylase activity. Increased levels of both XDH and XOD activity were observed in pancreatitis group. In the case of α-amylase administration a similar increase in XDH activity was observed but, in the case of XOD, the increase was of lesser magnitude than in pancreatitis (Figure 1b). No change in XDH or XOD activity was found when the α-amylase administered was heat-denatured. The reduced increase in XOD activity in the α-amylase-treated animals is explained by the fact that in the absence of pancreatitis there is no conversion from the dehydrogenase to the oxidase form. This could be clearly observed when the level of XOD was expressed as percentage of the total XDH+XOD activity (figure 1d). α-Amylase per se is not enough to induce lung inflammation, as could be observed in figure 1c. Despite obtaining equivalent concentrations of α-amylase in plasma after α-amylase administration (Figure 1a), neutrophil infiltration, measured as MPO activity was not modified in the lung. Although α-amylase induces an increase in the concentration of circulating XDH plus XOD similar to that observed during acute pancreatitis (Figure 1b), the conversion from XDH to XOD was only observed in the pancreatitis group (Figure 1d). In the control group, the percentage of XOD was about 10% of the total enzyme. This percentage increases to 40% in pancreatitis, when the proteolytic activity of plasma was higher. In the amylase-treated group, the percentage of XOD was not significantly modified with respect to the control group. Figure 2 shows the kinetics of α-amylase and XDH+XOD in plasma, and the final concentration achieved in AF 3 h after induction of pancreatitis. 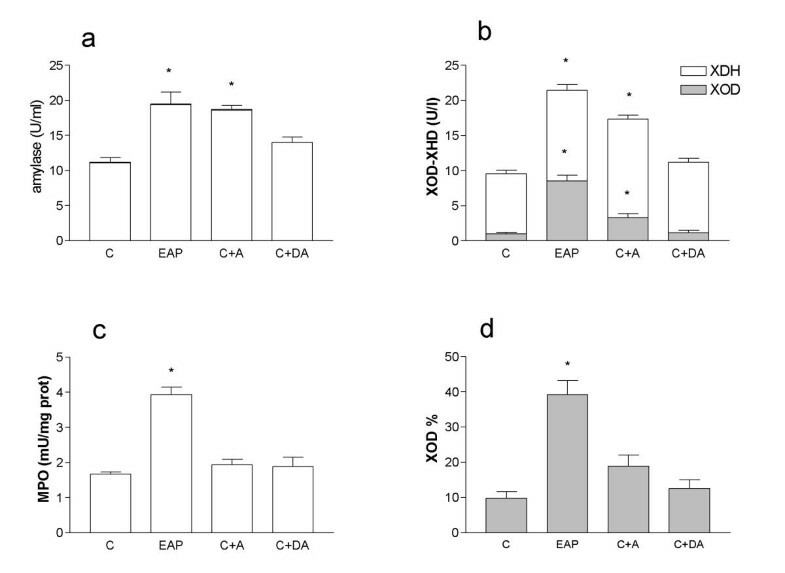 XOD and XDH concentrations (a) and α-amylase (b) in plasma and AF after the induction of pancreatitis. Samples of plasma were obtained at 0, 0.5, 1 and 3 h after induction of pancreatitis. Concentration in AF was evaluated 3 h after the intraductal infusion of taurocholate. * = p < 0.05 vs time = 0. As expected, α-amylase levels in plasma showed progressive increase after induction of EAP. Total XDH+XOD activity in plasma also increases and achieves significant levels 3 h after induction of pancreatitis. Finally, the conversion of XDH to XOD also occurs in a time dependent manner during pancreatitis. Interestingly, final α-amylase concentration in AF was over 5 times greater that observed in plasma. In contrast, similar concentrations of XOD and XDH were observed both in plasma and AF at the same time point. The increase of total XDH+XOD activity in plasma was prevented when peritoneal lavage was carried out (Figure 3a). Nevertheless, peritoneal lavage did not prevent the XDH to XOD conversion. Peritoneal lavage also prevented the increase of α-amylase observed in plasma after the induction of acute pancreatitis (figure 3b). Finally, the increase in MPO activity in the lung observed after the induction of pancreatitis was also prevented by peritoneal lavage (Figure 3c). Effect of peritoneal lavage (PL) in XDH+XOD (a) and α-amylase (b) plasma levels, and in MPO activity (c) in lung. Peritoneal lavage prevents the increase found in α-amylase, MPO and total XDH+XOD, but does not affect the increase in the % of XOD observed during EAP. * = p < 0.05 vs control; + = p < 0.05 vs pancreatitis. Figure 4 depicts the concentration of α-amylase measured in the vascular perfusate at the output of the isolated intestine when incubated in AF. α-Amylase was undetectable when the intestine was incubated in saline solution (data not shown). When intestine was incubated in AF α-amylase in the vascular perfusate showed a rapid increase, which achieved a maximal concentration in 10 min and was maintained until the end of the experiment (60 min). α-Amylase absorption from isolated perfused intestine incubated with AF obtained from animals with pancreatitis. Samples of the perfusion buffer were obtained after placing the organ in the AF t = 0. Maximal concentration was achieved 10 min after the initiation of the incubation and maintained for 1 h. * = p < 0.05 vs. time = 1 min. The involvement of XOD-derived oxygen free radicals in the pathogenesis of acute pancreatitis has been extensively reported [3–5]. In pancreas, conversion of XDH to the free radical-generating form XOD occurs during pancreatitis and is due to the intrapancreatic proteolytic activity. In addition, total XDH+XOD activity in plasma increases significantly after the induction of pancreatitis. In the early stages of acute pancreatitis, circulating XOD may act at distant organs generating the superoxide radical species that promote P-selectin expression and recruitment of neutrophils . Pulmonary endothelial cells seem to be particularly sensitive, since systemic XOD-induced P-selectin up-regulation was detected only in the lung . This sensitivity could be also related with the environment generated by the disease, with high concentrations of circulating cytokines, activation of complement system and other potentially deleterious mechanisms operating. It could be suspected that, as it occurs with other enzymes, the increased XDH+XOD activity observed in plasma during pancreatitis is related with the release of this enzyme from pancreatic tissue. Nevertheless, in physiological conditions, XDH/XOD is also bound to the polysaccharide chains of heparin-like proteoglycans existing on the external surface of the endothelial cells [9, 10]. We have recently reported that during pancreatitis the increase of XDH/XOD observed in plasma is related with the mobilization of the XDH/XOD enzyme bound to the surface of the endothelial cells, in particular, from the endothelial cells of the gastrointestinal tract . Serum α-amylase is one of the most frequently used tests for the diagnosis of acute pancreatitis . Amongst the various factors released during acute pancreatitis, α-amylase could be involved in the mobilization of XDH/XOD attached to glycoproteins of the endothelial cells. This is related to the ability of α-amylase to hydrolyze the internal α-1,4 linkages of polysaccharides that could affect some glycoproteins and disrupt the binding-site of XDH/XOD. On the other hand, in vitro experiments demonstrated that α-amylase binds by carbohydrate-specific interaction to glycoproteins possesing N-glycans . Thus, the enzyme could also displace XDH/XOD through competition for the binding site. To evaluate this possibility, we administered an amount of α-amylase tailored to induce a final concentration in plasma similar to that observed in experimental pancreatitis. In this condition, we observed an increase in XOD+XDH concentration in plasma similar to that observed during pancreatitis (Figure 1b). The effect of α-amylase appears to be not due to unspecific interactions since heat-denaturalized α-amylase failed to induce the increase in XDH+XOD activity in plasma (Figure 1b). Nevertheless, the possibility that heat treatment inhibits the glycoprotein binding site of α-amylase cannot be excluded. In fact, there is no evidence in the literature indicating the capability of α-amylase to hydrolize membrane bound glycoprotein. On the other hand, it has been reported that α-amylase is able to digest proteoglycogen , indicating that this enzyme could act on protein-bound polysaccharides. In addition, α-amylase administration had effect only in the mobilization of XDH/XOD but the enzyme remains mainly in its dehydrogenase form. This form did not generate superoxide radicals, probably for this reason we found that, despite the increase in total circulating XDH+XOD, lung inflammation was observed only when there was a significant increase in the oxidase form of the enzyme (Figures 1c and 1d). The conversion occurs as a consequence of proteolytic cleavage of the enzyme probably due to the activation of proteolytic enzymes and this fact occurs only during pancreatitis. In fact, proteolytic conversion to the oxidase form was only observed after induction of pancreatitis (figure 1). These results indicate that, effectively, the pancreatic α-amylase released during acute pancreatitis interferes with the binding of XDH/XOD to endothelial cells, thus contributing to the increase observed in the plasma concentration of this enzyme. The proteolytic activity associated with the disease converts the enzyme to the superoxide-generating form, contributing to the inflammation in the lung through a free radical-dependent mechanism. Nevertheless, during pancreatitis, mobilization of XDH/XOD is restricted to the gastric and intestinal endothelial surface . To explain this fact we hypothesized that α-amylase present in the AF could be important in this regard. This fluid contains biologically active agents, such as pancreatic lipase, phospholipase A2, α-amylase, proteases, complement factors, kinins, and inflammatory mediators, which are released into the peritoneal cavity during acute pancreatitis . Products released by pancreas gain access to the systemic circulation by different pathways: transperitoneal absorption from AF, direct transfer into veins draining the pancreas and absorption into pancreatic and retroperitoneal lymphatics . Local concentration of α-amylase absorbed from AF could be greater in the gastrointestinal tract than in other organs. When comparing the concentrations observed in plasma and in the AF, we observed that the enzyme concentration is about five fold higher in AF (Figure 2). This fact does not occur for XDH/XOD. Therefore, a high absorption and local concentration of α-amylase in the gastrointestinal vessels could be expected and consequently, its effect on the XDH/XOD binding could be most important in this organ. To verify this possibility we performed a peritoneal lavage in a group of animals, immediately after the induction of pancreatitis (Figure 3). When AF was removed by the lavage, the increase in α-amylase activity in plasma was not observed and the inflammatory process in the lung was also prevented. With respect to the XDH/XOD, there was no increase in total enzyme concentration. This fact agrees with the hypothesis that α-amylase absorbed from the AF is needed to mobilize XDH/XOD and that the proteolytic conversion of the enzyme occurs through a different, independent mechanism. On the other hand, peritoneal lavage results in a reduction of XOD levels in plasma, but the difference is not very high. By contrast, differences observed in MPO levels in the lung as a consequence of peritoneal lavage was highly significant. This fact suggests that peritoneal lavage also removes other mediators involved in the development of the lung inflammation and pointed out the importance of the interactions between different pro-inflammatory pathways in this process. This consideration applies also to other mechanisms suggested by these results. For example, the observed conversion from XDH to XOD occurs by proteolytic cleavage but the particular proteolytic enzymes involved in this conversion remains to be elucidated. In addition, there are considerable interspecific differences in the levels of both proteolytic activity and protease inhibitors. Obviously, further studies are needed in humans to verify the applicability of these results to human disease. 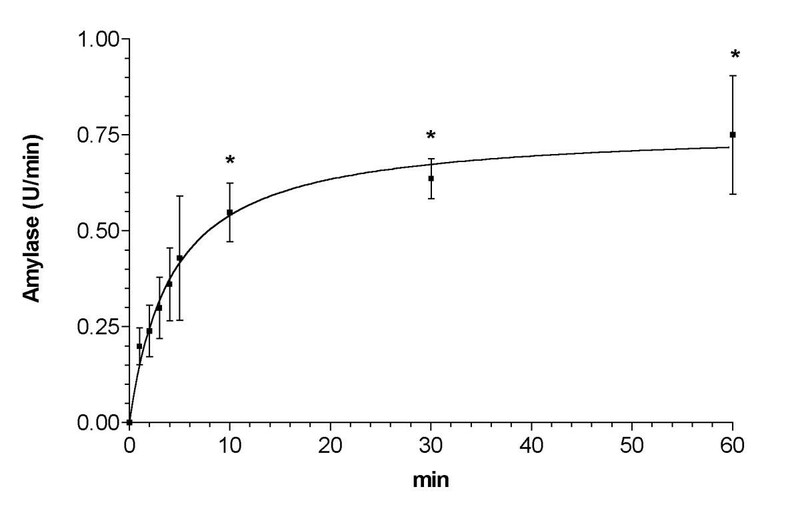 The ability of the gastrointestinal tract to absorb α-amylase from the AF was also directly assessed by incubating an isolated intestine with AF obtained from animals with pancreatitis and measuring the enzyme concentration in the vascular perfusate (Figure 4). Results indicate that enzyme absorption was fast and that the maximum value was achieved only ten minutes after the incubation. By contrast, XDH/XOD activity was not observed in the eluate, discarding a significant intraperitoneal absorption of this enzyme. This fact was not surprising since the concentration of XDH/XOD in AF is not increased with respect to that in plasma (Figure 2). Peritoneal lavage has been suggested to be of therapeutical value in patients with acute pancreatitis. Some experimental studies reported beneficial effects of this method in reducing the systemic effects of pancreatitis, but in general, experimental work started the lavage immediately after the induction of pancreatitis . In clinical work, results are by far less clear and our results could help to explain this fact . Lavages are performed in patients only after acute pancreatitis is diagnosed. Since the increased α-amylase concentration is one of the usual parameters for the diagnosis of acute pancreatitis, in the clinical practice the lavage does not start until the α-amylase concentration increases; too late to prevent the release of XDH/XOD induced by α-amylase. It is important to consider that α-amylase could enter the systemic circulation through different pathways. In a previous work, using the same experimental model, we have observed a similar involvement for lymphatic draining and peritoneal absorption pathways . Nevertheless, results obtained in this work suggest that only the α-amylase uptake by the splanchnic circulation is involved in the mobilization of XDH/XOD from the gastrointestinal endothelium. In conclusion, our results indicate that during pancreatitis, α-amylase absorbed from AF in the gastrointestinal tract interferes the binding of XDH/XOD attached to the glycoproteins of the endothelial cells (Figure 5). The proteolytic activity associated with the disease converts the enzyme in the superoxide-generating form, inducing the inflammation in the lung through a free radical-dependent mechanism. 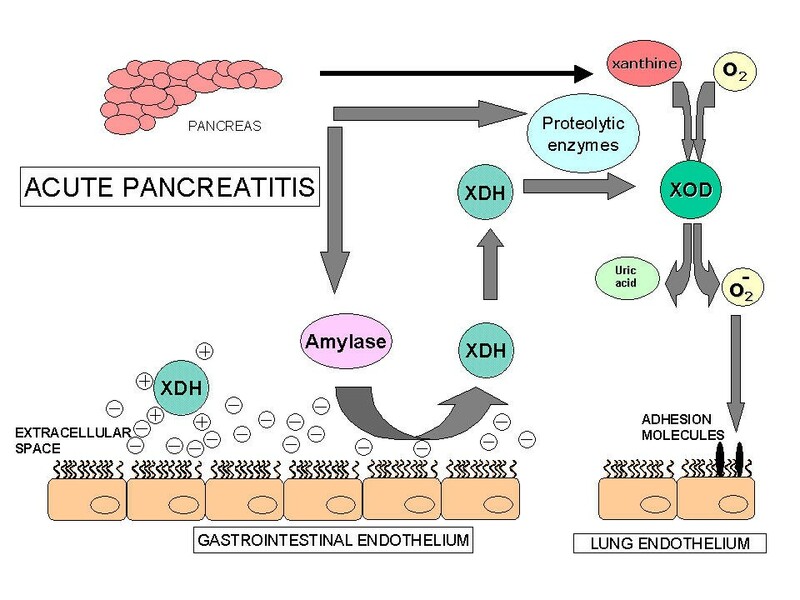 Suggested mechanism of the mobilization of XDH/XOD from the surface of the endothelial cells of gastrointestinal tract during acute pancreatitis: α-Amylase released from the pancreas acts on the polysaccharide chains of the endothelial cells and mobilizes the enzyme, mainly present as XDH. Proteolytic enzymes convert this enzyme into its oxidase form. In addition, acinar cells from the damaged pancreas release xanthine resulting from purine catabolism. Then, the simultaneous presence of xanthine and XOD in the bloodstream constitutes a circulating free radical-generating system that could induce the up regulation of cell adhesion molecules and the inflammatory response in the lungs. *IIBB-CSIC: Institut d'Investigacions Biomèdiques de Barcelona – Consejo Superior de Investigaciones Científicas; **IDIBAPS: Institut d'Investigacions Biomèdiques August Pi i Sunyer. This work has been supported by FISss grants 01/0949 and PI020286; S.Granell and M.Genesca are recipients of IDIBAPS predoctoral grants. SG carried out the experimental animals models and biochemical determinations. OB participated in the design of the study and performed the statistical analysis. MG carried out the experiments with the isolated intestine. LS and JS participated in the design and coordination of the study. EG drafted the manuscript and DC conceived the study and participate in its design and coordination. All authors read and approved the final manuscript.